Some time ago Geoff Brown asked about the drive system that we used in the model. 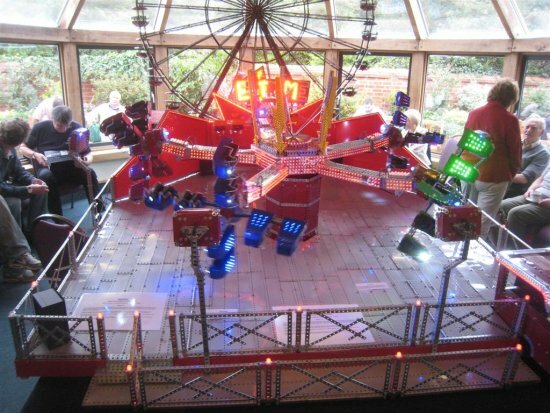 The model has basically 4 motions; the centre column rises up into the air to allow the cars to clear the floor when they swing up into a vertical position, the whole ride rotates on it's centre axis, the arm ends lift up into the vertical position and each set of 8 cars (4 x 2)rotate. When we designed the model we wanted to be able to control each action individually and in groups: For example we wanted all five arms to rise up together but we also wanted to have individual control over each individual arm. We decided to use stepper motors, this gave us some advantages in implementing our chosen design criteria. In all we used 12 stepper motors and 1 normal DC motor. The DC motor is a 'Como' motor gearbox which drives the whole ride around on it's central axis. The drive is by one of Dave Taylor's large tooth pinions onto one of his large geared rings. The drive from the motor/gearbox to the pinion is by a non-Meccano toothed belt drive. We first used a triple belt drive here (3 belts in Parallel) but there is so much torque from the 1.2 metre diameter rotor that slippage was a problem. This motor can either be controlled by a standard DC bench power supply or from a microprocessor via a 'H' bridge type circuit. The biggest problem that we have had with this drive unit is when the grease in the gearbox solidified and seized the gearbox. Geoff Brown has a picture of us at the Lincoln show repairing it. 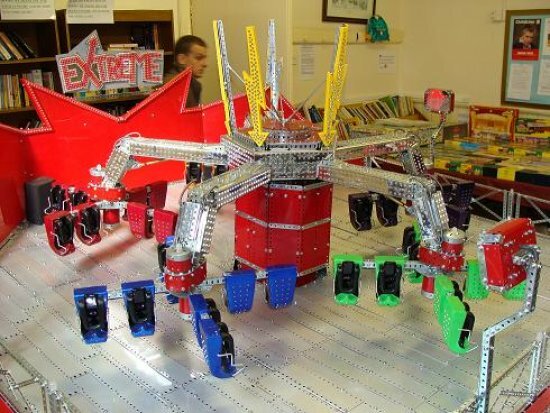 Each set of 8 cars is mounted onto a crucifix type spider and is driven round by a hybrid stepper motor. We have used a 4:1 reduction pulley drive between the motor and the rotor. The pulley drive gives us the possibility to offset the motor (as in the prototype) and provides slippage when the the motors start up. There are five arms each with a set of 8 cars on them so we have used five such stepper motors. They can be operated as individual units or all 5 together. The motors, like all our stepper motors, are driven by a microprocessor and darlington transistor arrays. Each of the 5 arm ends is lifted by a large hybrid stepper motor. The drive is directly mounted to the motor shaft. The lift is achieved by a dummy hydraulic cylinder mounted to the underside of each arm knuckle, this dummy cylinder is actually a threaded brass tube that revolves around a threaded rod. A Meccano axle rod drives down from the motor through a thrust bearing and universal joint made by Stuart Borril of Skegness. We were unable to use Meccano U/J's or threaded rods as they weren't strong enough: The car unit at the end of the arms weighs 2 Kg, even with fibreglass cars, and this has a CofG which is 8 inches from the pivot centre at the point of maximum lift. The distance between the ram centre and the pivot point at this instance is 1 ½ inches so the thrust on the ram and thrust bearing is 10.7 Kg in compression so you can see why we had to use M6 threaded rods. Again, the arms can be operated either individually or all 5 synchronised together. The centre tower is lifted by 2 more large stepper motors. One motor is mounted at each end of a Meccano axle rod. Two Nylon cords are wound around the axle rod and each is reeved around a pulley system of ½ inch pulleys and this lifts the centre telescopic section of the Meccano tower. The 2 motors are connected to the same microprocessor and thus stay synchronised. The weight being lifted by this system is 32 Kg. 4 microprocessors control these 13 motors and a further 8 control the various sections of the 4,500 LED's that illuminate the model. A 13th microprocessor can be used to automate the ride sequence if required. We rarely use it, its more fun to drive it yourself. This is a bit of a long winded explanation. stored on a 16 Kbit serial EEPROM. The device can be purchased as a 24 pin DIP device or, as I purchase them because it is cheaper, in OEM component form which is the interpreter IC, the EEPROM and the 20 MHz resonator. This option takes up more room on the circuit board. The downside to the BASIC Stamp is that the BASIC program has to be interpreted every time it runs and this soaks up processing power which can make the device slow for some applications (I am referring specifically to the BS2). On our next ride model we are going to use PIC processors but code them in assembly language, this will really cut the cost down and give us much, much more speed at the expense of ease of programming and prototyping. 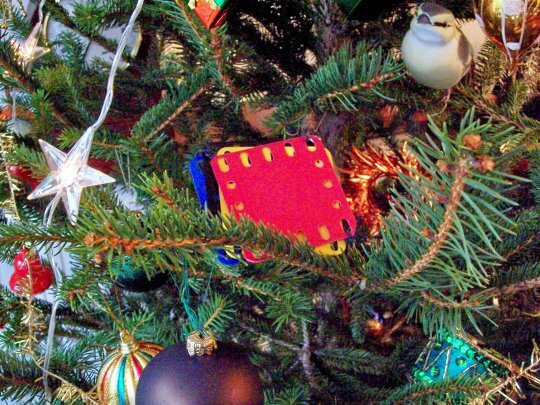 We will also save space on the circuit boards. 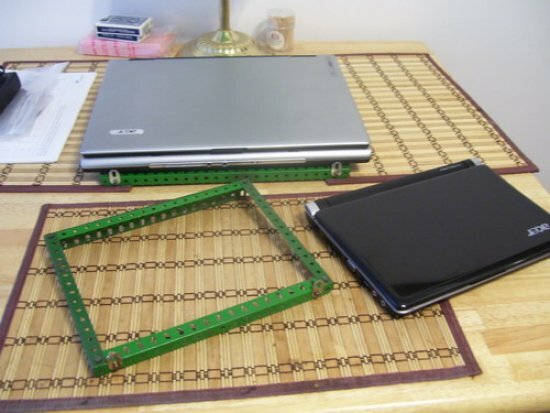 my Meccano bench has a thin carpet that does not allow any air to move under the notebook computer. The flat girder raises the back up allowing for a better typing angle much the same as your desktop computer keyboard. You can stick on some foam padding if you don't want to scratch up the laptop. The longest series is the "A" (accessory) since for historic reasons it included all the Dinky Toys. Can anyone help me identify this clockwork motor - is it a 1A, 1B or what? Size is 4 ½" x 3 ½". It is beyond question a no 2 of late 1932 vintage. It is a 2 because - the 2 case pillar screws at the bottom are in the next - to - corner holes. The 1A has the r/h one in the second hole in. This is an infallible check between the 2 types. The spray hole in the middle of the plate came in in mid 1932. Later in 1932 the colour changed to a bright red with green levers. Thanks a lot for that. It seems to be quite powerful and runs very well probably because it's still coated with fairly free running oil. I'm not usually a big fan of clockwork models but I might have a go at something. I vaguely remember reading somewhere that the No 2 was manufactured by Marklin. Is this true? Let me see if I can give you a concise answer without overkill. IN the beginning, before ww1, FH approached Maerklin to build him clockwork motors and they came up with 2 reversing types. The no 1 was 7 x 9 holes and the much bigger no 2 was 10 x 15 holes with 3 drive spindles. These three spindles caused it to be christened the TRINITY motor in later years. When WW1 broke out, the relationship with Maerklin was cut. However Maerklin were given the right to mfr Meccano under their own name in Germany and they continued to do so until recent times. This included continuance of both the motors under their own name. In chemically blackened finish to start with, in the late 20's the motors acquired a 2 speed facility and then started being painted scarlet with green levers - in 1929 if I remember aright. various fine detail changes and improvements along the way, survived until about 1950 in England and until the 60's in France. In particular, it changed from nickel to maroon painted finish in 1927. 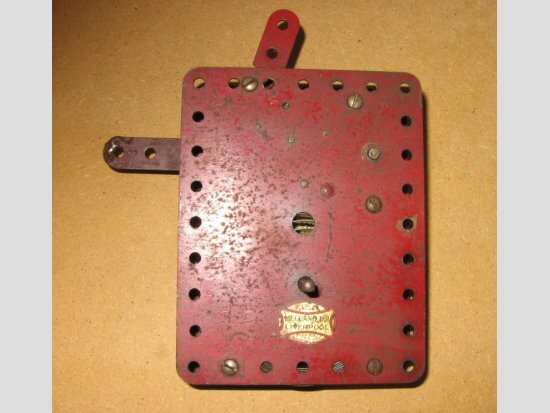 Now in about 1930, probably driven by the success of the c/w trains and confidence in their own mfg ability, Meccano introduced a 6 x 8 hole non reversing motor also known as a no 1. In addition, they looked at the old no 1 and decided to fit a wider much stronger spring in basically the same casing and call it the no 2. At the same time, they changed the governor and added a fifth stage to the gear train. I think the intention was that that the old no 1 would fade away and, to avoid confusion, it was reidentified at this point as the 1A. 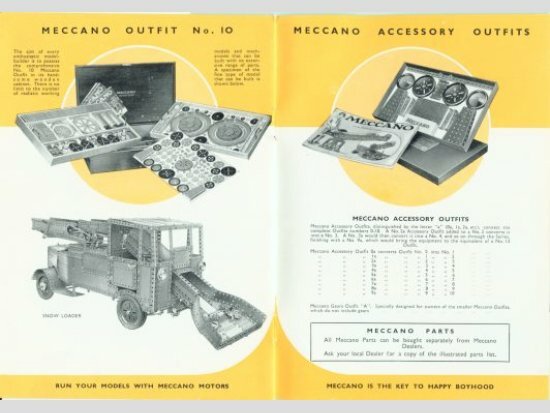 However, what seems quite plain at least in retrospect was that Meccano had a lot of spare material still around for the 1A. And it continued to sell well against the no 2 which appeared to cost a lot more money for something that appeared at a casual glance to be the same size to the man in the street. The nett result was that all three motors continued until just after WW2 with the 1A continuing to be the best seller up until the war! So - to answer your question - the Meccano no 2 was their own baby although it plainly owed its lineage to that WW1 No 1. The Maerklin no 2 was always the big 3 spindle job. The no 2 is much the most powerful, slowest and longest running motor in the range. The main problem that came to afflict it was the poor governor design which it shared with the large Hornby c/w loco mechs. The mazac flyweight was prone to swell and disnitigrate and the little spring that laughingly kept it under control failed to do so! Thus the motor is often sluggardly in operation and surgery on the governor can make a world of difference. O that they had kept the little Maerklin governor design of the 1A in it instead! 1A's always run like a dose of salts - noisy, cheerful and indestructible! I thought that you would be interested in this model, shown in its natural surroundings. It has been somewhat modified from the leaflet model, the principal one being to slightly widen the conveyors to accommodate 3" wide Rufflette Tape. Others include eliminating a horizontal sprocket drive and a sliding shaft with a worm on it. I found the instructions particularly bad. They appeared to have been written by someone other than the builder. It looked as if the writer had partly dismantled the model and described what he saw with no advice about the tricky bits. The engine unit was not illustrated properly and so had to be removed at a late stage to correct it. The body and conveyors had to come off several times to get everything to work. I have not tried to operate it with real snow, but hope to try it with Perlite when I get a further supply. From memory this was a competition winning entry (possibly by Noel Ta'Bois) which was then presumably written up by someone at Binns Road. 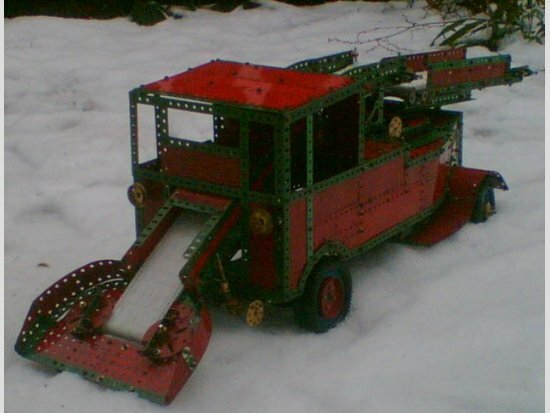 The prize-winning model of the Joy Snow Loader was by Noel Ta'Bois and can be seen here; MM Apr. 1939 p.249. The set 10 leaflets were first available in 1954. A snow loader, slightly different to the leaflet model, appeared earlier in a products catalogue dated 16/1053/15, shown in the attachment. Thanks for the interesting information about the snow loader. I thought that it had been modelled on a Russian prototype - an earlier version of one shown on television after our last big dollop of snow. I find that information about the prototypes of Meccano Models is always useful at exhibitions. I see that the model was simplified considerably, partly so that it could be built with the limited resources of a No. 10 set. It only has a forward and reverse gear box, and the discharge conveyor cannot be raised and lowered. We need a slightly smaller version of the prototype here to dump about 20 cm of snow from the road onto the grass verges.but I don't think the Residents' Association will fund one. Also, its history page confirms that Nikko "bought Meccano" in 2000 (presumably in its entirety), and sold out completely in 2007. In the interim, the venture capital group "21 Centrale Partners" (www.21investimenti.it) bought a 49% share in 2003 -- this is the group established by Benetton), which they still own. The current ownership is shown as 51% belonging to "Ingroup" -- I can't find any record of this company, which possibly is connected with the directors Alain and Michael Ingberg, who have been there throughout. After a year of Meccano inactivity I got round to building the Nuremburg Clock this Christmas based on the April 1972 Meccano Mag. However I have come across a big problem, I have built it with care and with special attention made to the escape wheel, but there just doesn't seem enough power in the machine to move the Foliot Verge. Has anyone else built this and come across the same problem or could offer any advice? I have built this clock but with an additional minute hand have a look at my version. Power should not be a problem but great care needs to be taken to make sure there is no friction and everything is precisely aligned. One way is make sure you use all perfect parts and give rods a burnish with steel wool. You need patience with this model but you will be rewarded when you here it running and your family sees a working clock made with Meccano. 1. Built the motor straight into the model from its box, not a good idea! Unless you have run your motor on another model recently under load, try a few wind/unwinds and a drop of oil under no load just to get the thing accustomed to running. 2. Try running the gear train as you assemble it one pinion/gear mesh at a time, again like the motor I put the whole creation together and sat back and expected it to work! Wrong! 4. The part I found giving the most issues was the 1 ½" corner bracket, as it has two rods through it, and again by adhering to 2 you can fine tune the degree of mesh on the gear/pinions they carry. really as it is nice to see it running because of its simplicity and once the escapement is running it certainly lets you know because of the thud it makes! Indeed. But sometimes this is easier said than done. We need not mention meccano rods, best forgotten, with good straight non meccano rod used instead. Many meccano brass parts are absolutely horrible, with bores in couplings not being at right angles, etc. I am currently building a model which appeared in CQ, and which requires a similar degree of accuracy. Just discarded three or four threaded couplings, as the axial threads were angled. I also had to carefully sort out ten small bevel gears, as some of the bores were not exactly axial, giving a good wobble to the gear. Yes, Meccano is a toy, but given the prices which Meccano Ltd. asked for these parts, one would have expected better. I built this as my first clock. I cribbed my version from Lindsay Carroll's web site and it started to tick almost before it was completed. I re-designed the escapement wheel (not that there was anything wrong with his version) to make it lighter and spent some time adjusting it. It now runs very well, it gains during the first half of it's wind and lloses during the second half so overall it keeps time. I have had a great time experimenting with it and it spurred me on to build my own design of self winding pendulum clock. I took both clocks to Skegex last year (2009). I used gears and pinions in good condition. The same for axle rods, they must be straight and smooth. The escapement wheel needs to be made as accurately as you can, this is vital. Be careful to ensure that all of the angle brackets are the same length and protrude from the wheel by the same amount. The depth of engagement of the spring clip pallets need to be adjusted carefully for depth of engagement with the angle brackets, it too deep then the spring will not be powerful enough to turn the wheel. There is no real advise in the instructions of how to set the spring clip pallets, I studied very closely Lindsay Carroll's pictures on his web site, they are very good. One more point: The escapement wheel in my clock wobbled considerably. This was due to the clearance in the strips for the axle rod. The fit was quite sloppy and the wheel hanging on the end of the axle rod in a cantilever fashion just exaggerated this. I doubled up the strip with a fishplate and adjusted it to give a closer fit on the axle rod. Chris - You might try some non-meccano rods (eg Ashok) to get something straight. And Harder. Improving bushings is also a source of better performance in clocks. Remember, they basically run contrary to most gear trains - losing power with each step, rather like an overdrive transmission only several orders of magnitude worse!. Consider each step in the gear train for possible improvement. This is a little bit of know-how that I picked up from somewhere. It works well with cranes, don't know about clocks. The trick is to assemble the gear trains dry, no oil. This amplifies the effect of any friction due to misalignment and makes it easier to detect. When you finally oil it the whole thing runs like silk! 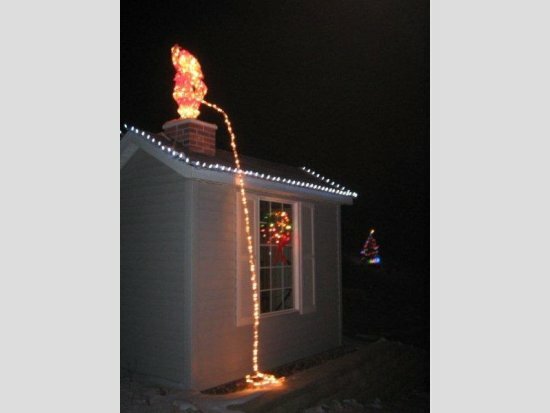 Once again, I was disqualified from my neighborhoods "Best Decorated House" contest, due to my bad attitude ! !